State and regional organizations hope to receive a dose of ARRA funds to boost health information exchange to the next level. Signed, sealed, and delivered. On February 17, President Obama signed the American Recovery and Reinvestment Act (ARRA) aimed at providing a boost to the U.S. economy with specific investments to increase the health information exchange (HIE) movement across the nation. The bill allocates more than $17 billion to implement EMRs in healthcare provider settings and an additional $3 billion to improve the nationwide healthcare technology infrastructure—money that is expected to be steered toward the expansion of HIEs and regional health information organizations (RHIOs). While most industry insiders acknowledge the unique opportunity presented by the ARRA funding and are optimistic about the potential, the package itself has sparked much discussion and speculation about how best to move forward. In response to concerns voiced in the industry, Mosaica Partners, a Florida-based HIE consulting firm, initiated the white paper “Leading Practices: Leveraging the Economic Stimulus Package for Health Information Exchange” to gain insight into approaches being used by various states and regions in their planning efforts. Thielst echoes Kolkman’s position, pointing out that “the biggest concern is that providers will jump into implementation before they are ready. Charlie Jarvis, assistant vice president of healthcare industry services and government relations for NextGen Healthcare, points out that it will be easy for organizations to get caught up in the movement’s technology aspect and potentially miss the broader picture. “Choosing the right technology is extremely important … but it’s just as important to choose the right partners going forward,” he says. Start now is the message sent by experts across the field. Pointing to the well-known expression, “There are those who make things happen; there are those who watch things happen; and there are those who wonder what’s happening,” Kolkman describes the various levels of response and readiness currently being shown by healthcare groups as they prepare for the stimulus funds. Jarvis explains that all states will have to submit an HIE plan to the federal government before they can access the funds. “In my opinion, every state ought to have their plan submitted by the end of the year … or sooner if possible,” he suggests, adding that NextGen is encouraging its clients to adopt this strategy. Numerous states, including Arizona, Indiana, Kentucky, Massachusetts, Minnesota, New York, Ohio, and Virginia, are singled out in the white paper as being in a position to move forward successfully. As outlined in the white paper, the state created an initial interoperability road map in 2006 that resulted in the establishment of the Arizona Health-e Connection, a not-for-profit organization designed to spur HIT adoption. Actively promoting the exchange of electronic data, the state Medicaid program later received a Medicaid transformation grant, which was used to develop the Arizona Medical Information Exchange (AMIE). Other activities include the development of the Southern Arizona Health Information Exchange, based in Tucson, and funding for HIE planning across rural communities. By building on initiatives already under way, the state is cashing in on its current momentum and hands-on experience to keep its HIE plans moving forward, Kolkman says. This approach also enables the state to bring together a wide range of stakeholders to consider how the stimulus funding can be used to extend AMIE’s reach. Successful collaborations often hinge on the region’s or state’s ability to understand the value that stakeholders place on HIE—more specifically, what they may be willing to pay for once the stimulus dollars are no longer available. Alongside Arizona, Kolkman points to Virginia, Indiana, and Louisiana as leaders in forming a broad-based coalition. “All of these have laid a foundation for reaching out to their communities,” she says. According to Kolkman, the Indiana Health Information Exchange is nationally recognized as one of the few operating HIEs with a sustainable business model. It has been an active participant in many federal initiatives, including the Nationwide Health Information Network, and works closely with several highly respected universities, including Indiana University, Notre Dame, and Purdue. Building on a solid infrastructure, the state brought together the key stakeholders and established a coalition to create a cohesive approach for applying for funds. Opportunities were considered where stakeholders could collaborate on initiatives that included bringing together multiple partners to focus on one grant opportunity or pooling grant requests from multiple agencies to fund a project that spans organizations. Through these types of approaches, the state could present a unified vision that prevents spending fragmentation and competition among groups and optimizes the use of the funds, which are mandated to be managed by several different federal agencies. In the case of Virginia, once the ARRA became law, a Web site was created to garner input from interested parties across the state. In addition, the state conducted several town hall meetings to obtain feedback on how to proceed. Kolkman points out that Virginia officials have also made a concerted effort to make sure all hospitals and physicians will be made aware of the meaning behind the federal definitions of “eligible provider” and “meaningful use” and how they apply to the EMR incentives. “All of these states were building on a foundation already established. None of them were starting from scratch,” she adds. In the end, improving healthcare is the point—not just implementing technology, Thielst says. “The technology alone is not going to improve care, but it’s an important tool,” she notes. While it’s important to consider the overriding goal of the HIE when approaching questions about technology, Jarvis says there are other key considerations. Jarvis says the technology should be built around three main capabilities: e-prescribing, interoperability, and reporting data indicators. 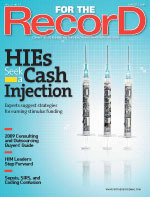 While the industry is generally excited about the opportunity for HIEs to take advantage of the stimulus funding, Jarvis expresses concern that some of the schedules set up by the government are not realistic, especially considering that healthcare has never had to quantify quality like it’s being asked to do now. Based on Mosaica Partners’ experience in the HIT arena and the information garnered through extensive interviews conducted for its recently published white paper, “Leading Practices: Leveraging the Economic Stimulus Package for Health Information Exchange,” the organization has developed a set of high-level recommendations for states and regions to consider as they formulate their plans for leveraging the stimulus funding. • Centralize: Form a team to centralize your state’s or region’s planning. • Build on your foundation: Build plans and requests on previously laid foundations, such as your state’s HIT strategies and existing health information exchanges (HIEs) and telemedicine networks. • Establish partnerships: Establish and leverage public/private partnerships. • Collaborate: Encourage collaboration efforts across stakeholder categories such as hospitals, universities, local public health agencies, physicians, and consumers. • Coordinate: Develop plans that incorporate a holistic approach to utilizing the funds. Don’t scatter your efforts. • Communicate: Provide stakeholders with frequent updates on the status of stimulus funding and the state’s plans to take of advantage of the American Recovery and Reinvestment Act. Share ideas and keep communication lines open. • Support: Develop specific programs to assist providers to understand the role of HIEs and HIT in general, modify and optimize work processes, and choose a suitable EMR package. • Manage: Develop a solid approach to managing and auditing how the funds are both allocated and used. Develop clear metrics for measuring the progress of those organizations receiving funds. • Standards: Ensure that the existing and evolving standards are enforced when implementing HIT and constructing an HIE. • Connect: Connect with other states to share ideas to enhance and improve your plans.